An amazing trip with lots of action. One day we had 6 different makos! Also plenty of blue sharks, a couple of smooth hammerheads and even a pod of orcas. 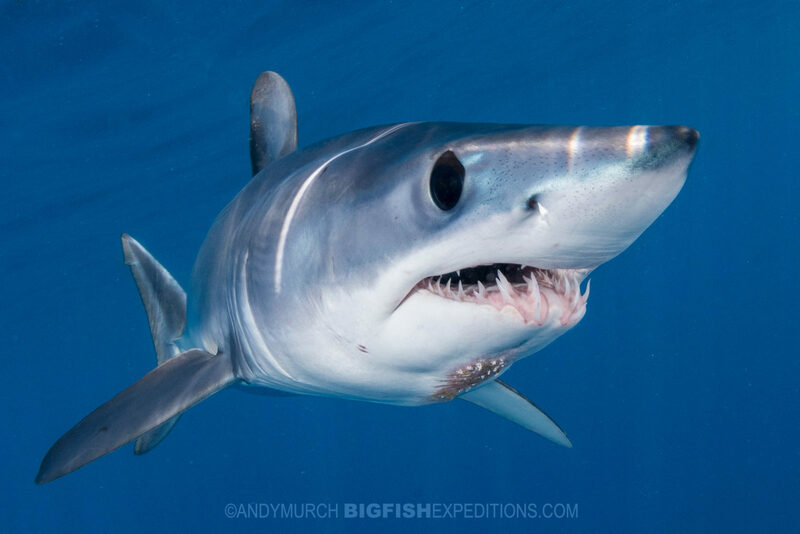 Some of the makos stayed for hours, enabling our guests to get endless world class mako shark images. 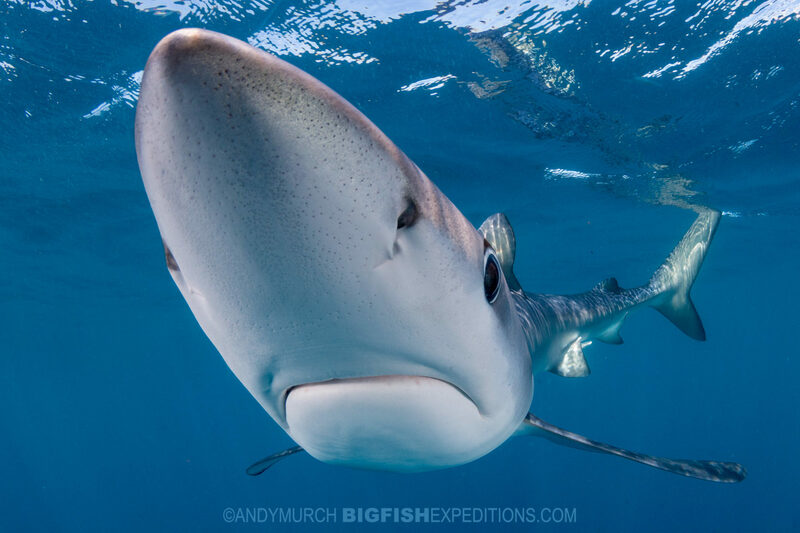 The nice thing about blue sharks is that they show up fairly quickly and linger all day if there is a hint of food available. 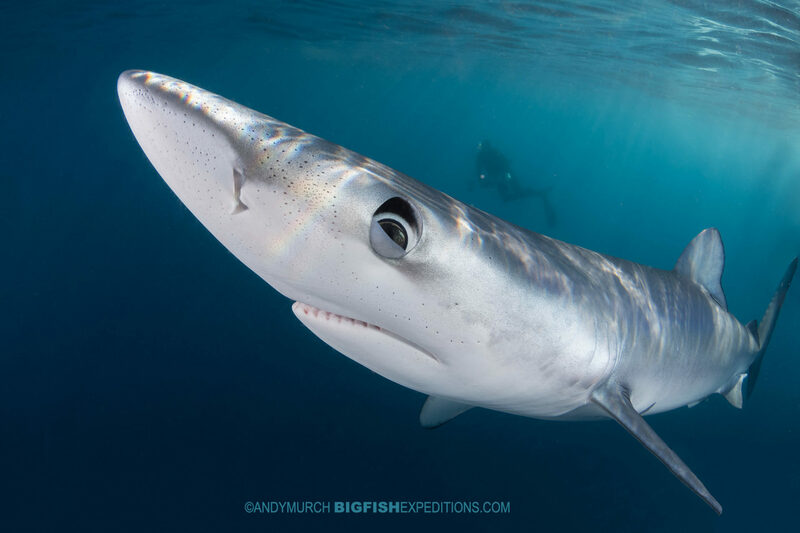 Consequently, we didn’t need to wait long for our first blue shark interactions. The other nice thing about blue sharks is that they are extremely relaxed and nonchalant around snorkelers. This meant that we could get extremely close to them and come home with some really fun shots. On our first day, we had three blue sharks show up. One was around 7ft long – a respectable size for a blue shark in the 21st century. On our first day there wasn’t much wind. Wind is important so that your boat is drifts over the surface, creating a nice chum slick in the process. So we went offshore where we were sure we’d find blue sharks even if we didn’t have much of a slick. Makos are more common closer to shore so when our second day dawned a bit windier, we stayed inshore to look for makos. Before long, we had makos and blues. In fact this turned out to be our best day on the water of both back-to-back trips. We had one very keen mako that stayed with us for at least two hours and was more than happy to pose for shot after epic shot. I try my best not to demonise sharks. 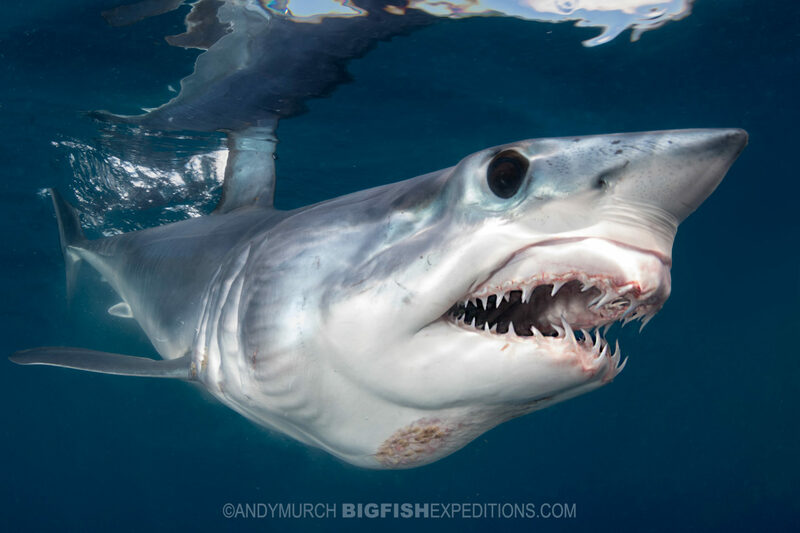 However, shortfin makos look so menacing with their bristling teeth, big eyes and pointed noses that it seems a disservice to portray them as anything other than the finely tuned predators that they are; teeth and all! 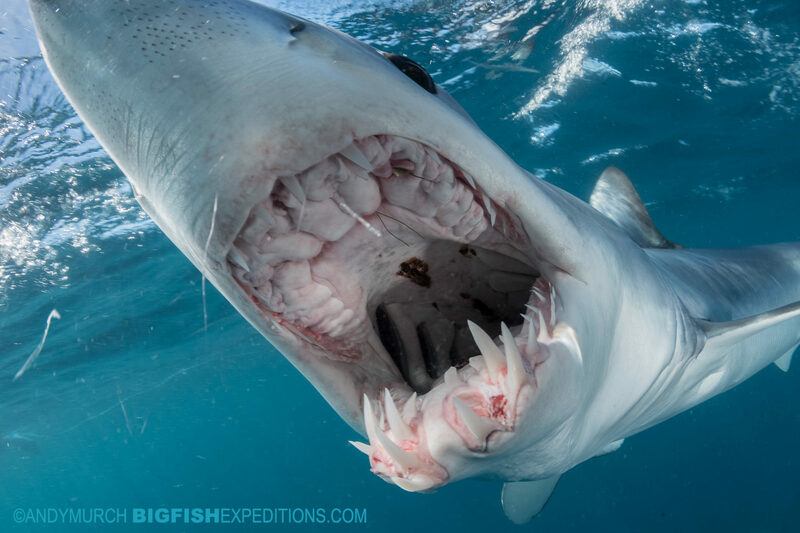 Some of the makos that we encountered on this trip were more than happy to open wide for the camera, resulting in some very dramatic images of their formidable fanglike dentition. Over the course of the 2 trips, those menacing makos were kind enough to maul my camera multiple times, leading to great pics but also to some deep gouges on my acrylic dome port. Everyday I polished out the smaller ones with a scratch removing kit that I bought with me but inevitably, I got some grooves that were so deep that my dome port was eventually a right-off. You can see some of the damage in the form of white lines on the glass in this image. As fun as it was to play with the makos, I still have a soft spot for blue sharks because their personalities are so ‘nice’. Of course, I am anthropomorphising but they are definitely a more relaxed, slow moving species; especially when compared to their snaggletoothed cousins. Unfortunately, I got sick and missed the last day at sea. That was a shame because I missed the pod of orcas that our guests got to enjoy. They even managed to jump in with them a couple of times. Hopefully we’ll see more orcas next year. Fortunately, I didn’t miss the two Smooth Hammerheads that showed up the day before! 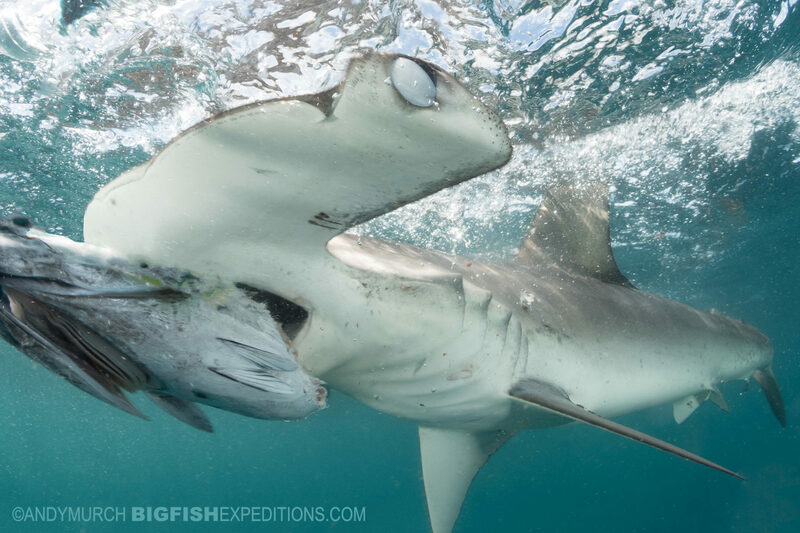 We knew that smooth hammerheads were a possibility but they are not seem that regularly during mako season because the water is slightly colder than they tend to like. The two we saw, nibbled at the bait but they were extremely shy. As soon as I approached them with my camera, they bolted back into the depths, returning only once we were back on the boat. We then played a long game of cat and mouse but the only time I could get any decent shots was when the larger of the two was munching on the bait. At least I have proof that we saw them. 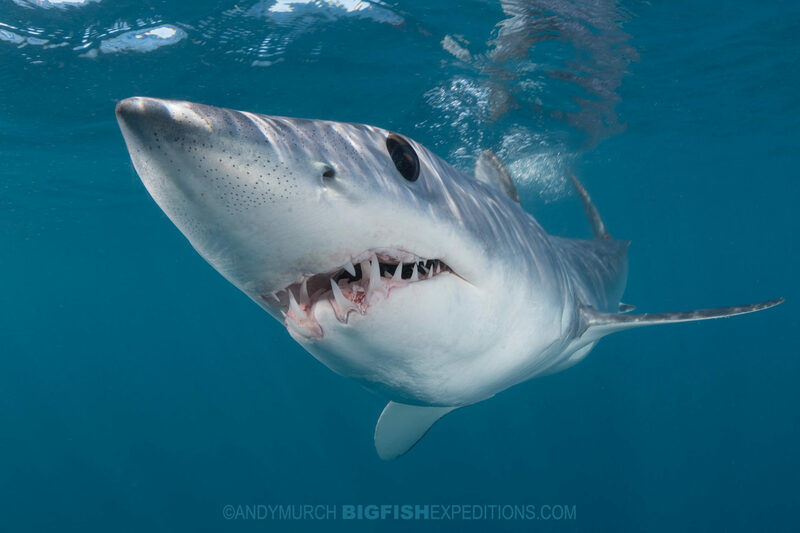 After such a great trip, we are of course planning to return to Cabo for another year of snorkeling with blues, mako sharks and hopefully a smooth hammerhead or two. This trip is open to virtually anyone that is comfortable snorkeling in open water. 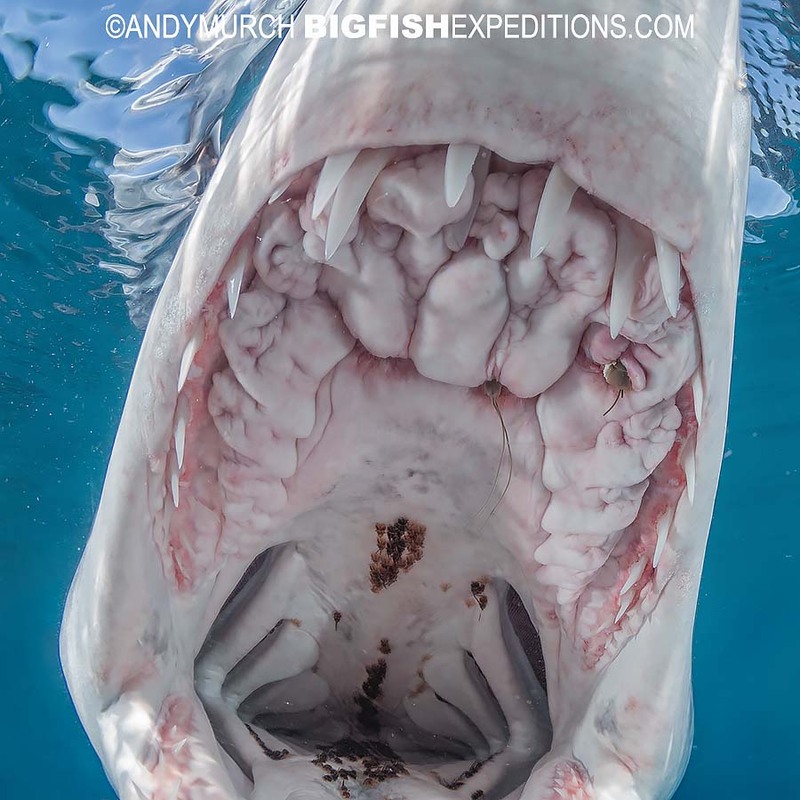 It is an amazing experience if you haven’t been in the water with big sharks before but it is also a world-class opportunity for pro-shooters that are looking for extreme images of one of the planet’s greatest marine predators.